When I first started this blog, I never really knew what I wanted out of it, and was just writing it for myself. I chose the simplest layout I could find, with no clue about how to alter it to make it look pretty, and ended up choosing a simple floral pattern and putting my name on it for the blog heading! I've been wanting to change it for such a long time, but i'm pretty useless at drawing, and anything artistic really! However, one of my housemates, Natalie, studies Textiles at Uni, and she is amazing at drawing and painting, and just generally has such a good imagination for this sort of thing. So together we sat down and designed my logo! The logo is just really a mixture of some of my favourite things, taking inspiration from images on weheartit, which is such a lovely site! Natalie and I designed it in three parts, with three different objects being incorporated; teacups and saucers, doilies, and cameo. If you follow me on twitter, or just have read quite a lot of my blog posts, you would know that tea plays a pretty large role in my life, as lame as it sounds! I have a cup of tea first thing in the morning, and last thing in the day, when i'm having lunch or dinner, or just whenever! 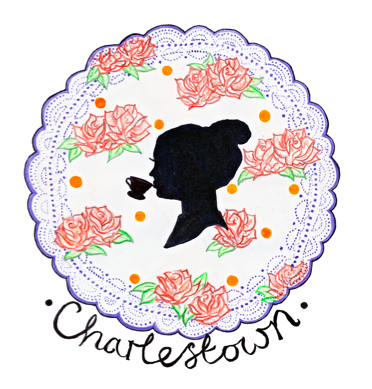 Me and my lovely friend, Sheri, have set up a Tea Society at Uni to just chat over tea and cake, test out the local tearooms, and to just basically share our love of tea with others! Cameo is my favourite type of jewellery, I've lost count of how many pieces I own! I love the silhouette's, pretty lady's with their hair in buns, and all of the detail around the edge. If i ever get a tattoo, it'd probably be a cameo of some sort! I love the pattern around the edge of a doily, and just seeing all of the pictures of them on Weheartit just made me realise how much one would have to be included in my logo/banner! I also think it has a similar effect of a cameo around my logo, almost like a picture frame. The finished product, thank you to my lovely housemate, Natalie! I'm so happy with it! She hand drew, and painted, it! Did you all have a lovely Halloween, what did you get up to? I dressed up as a Dead Bride, which i'm planning on showcasing on here! I can't believe it's November already, it's one of my favourite months with the weather, fireworks night, and just general wrapping up warm, bonfires and dark nights. What are your favourite things about winter time? I can't wait for Christmas! I have a bit of work coming up at the moment, and am now a Lifestyle editor for my student newspaper, which I can't wait to get started on, but i'm still planning on blogging regularly, I love having this blog, it's like another friend listening to my day, how i'm feeling and what I've been doing! Oh Charlie your header is gorgeous, I noticed this the other day. It definitely suits you down to the ground! So simple yet perfect! Really is. Amazing! This blog looks juѕt like my old one!